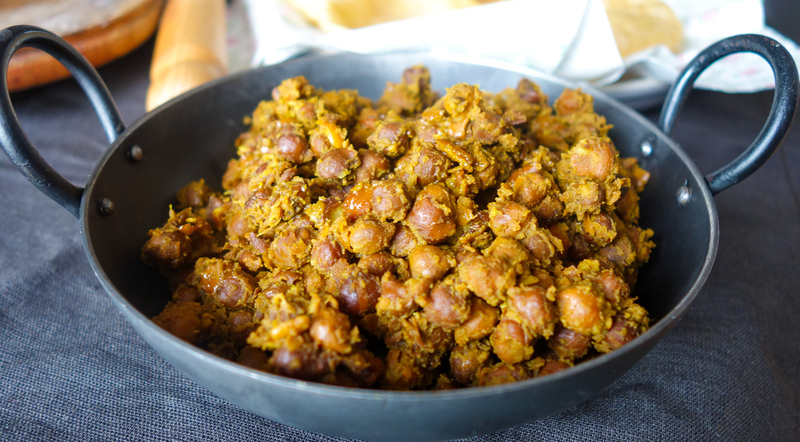 Sukhe Kale chane / Dry black chickpeas recipe, that I’m sharing here today , is the one , that my mum cooks for ashtami Prasad (offering to goddess ), and now I also follow the same. This recipe is cooked, using very few ingredients which are had during ashtami. It does not contain any onions, garlic, or tomatoes. I cook these early in the morning on the day of ashtami, as I make prasad. This goes perfect with pooris (fried puffy Indian bread), and halwa (semolina pudding), that is the offering to goddess Durga on this day. 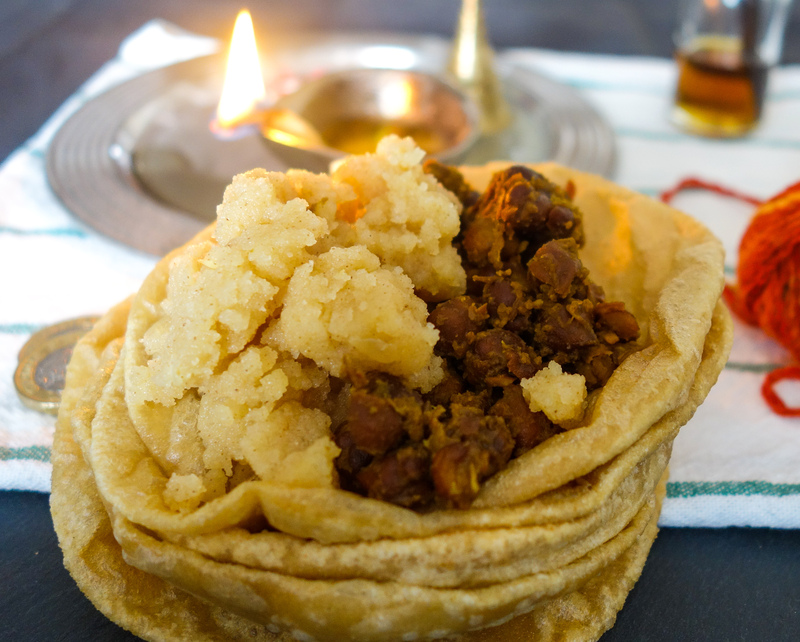 This prasad (offering ) is the regular meal, prepared in most of the households, to open the navratri fast. It is offered to goddess Durga, and then served to little girls along with some gifts, as these little girls are considered the avatar or embodiment of goddess Durga. 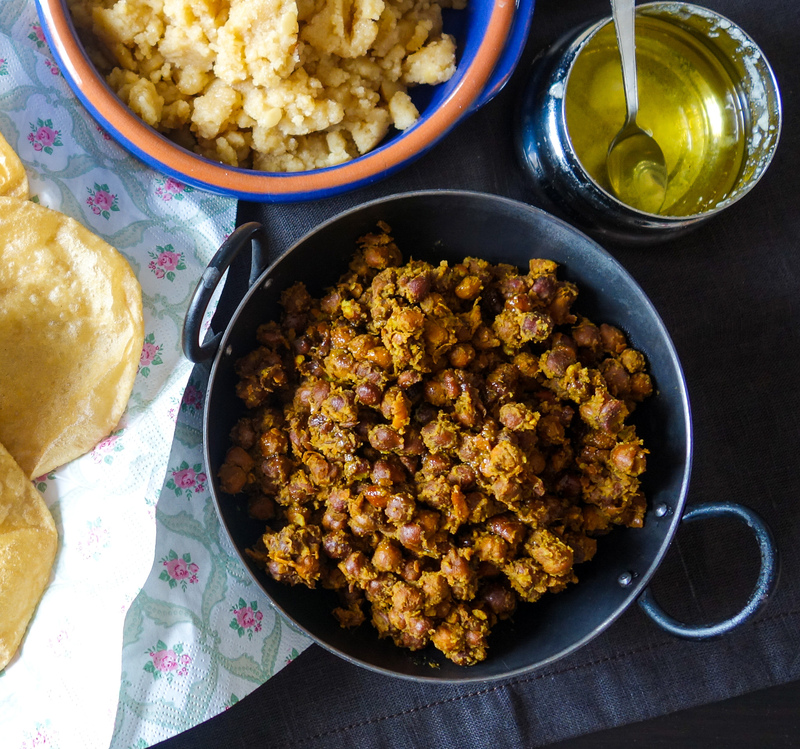 To cook these ashtami special black chana, you would need black chickpeas (kale chane),mustard oil (or oil of your preference), Hing (asafoetida), Jeera (cumin seeds), Grated ginger (or ginger paste),salt, red chilli powder ,turmeric powder (haldi), amchoor (dry mango powder), and garam masala. I cook all my pulses ,beans, legumes in a pressure cooker as it saves a lot of time.If you are cooking in a pan, it takes almost double the time or even more, to get the pulses cooked. Soak the black chickpeas overnight in enough water. When cooking in a pressure cooker heat mustard oil to a smoking point.Add Hing(asafoetida) , jeera (cumin seeds), ginger (grated or paste), and sautè till the raw aroma of ginger goes away. Add salt, red chilli powder, turmeric powder.Give it a good mix.Add water- just an inch over the chane (black chickpeas), and pressure cook for about 35-40 minutes, on medium heat. Turn off the heat after 40 minutes, and let the pressure settle. Once the pressure is settled, open the cooker, and give the chanas a stir. Open the lid and let cook for another 10-12 minutes , till the water evaporates. Once the chanas have dried, add amchoor, a little garam masala and mix well. Ashtami chanas are ready. 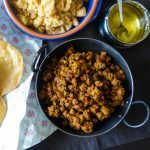 Serve them hot with pooris, with lots of halwa, and little love. Vrat/ fasting recipes are here- Samo seeds kheer, pumpkin halwa. 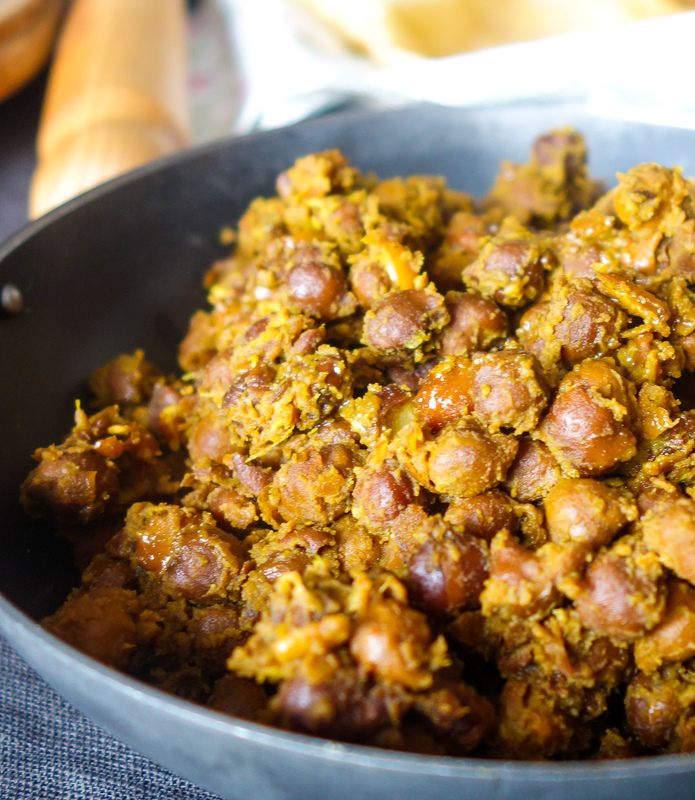 Check the Black chickpea / Kale chane curry recipe is here. In a pressure cooker heat mustard oil to a smoking point.Add Hing(asafoetida) , jeera (cumin seeds), ginger (grated or paste), and sauce till the raw aroma of ginger goes away. Add salt, red chilli powder, turmeric powder.Give it a good mix. Add water- just an inch over the chane (black chickpeas)., and pressure cook for about 35-40 minutes, on medium heat. 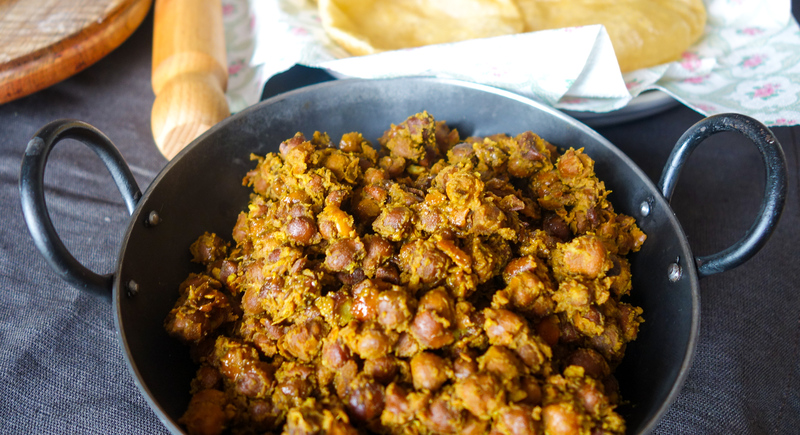 Once the pressure is settled, open the cooker, and give the chana a stir. Open the lid and let simmer for another 10minutes , till the water evaporates. 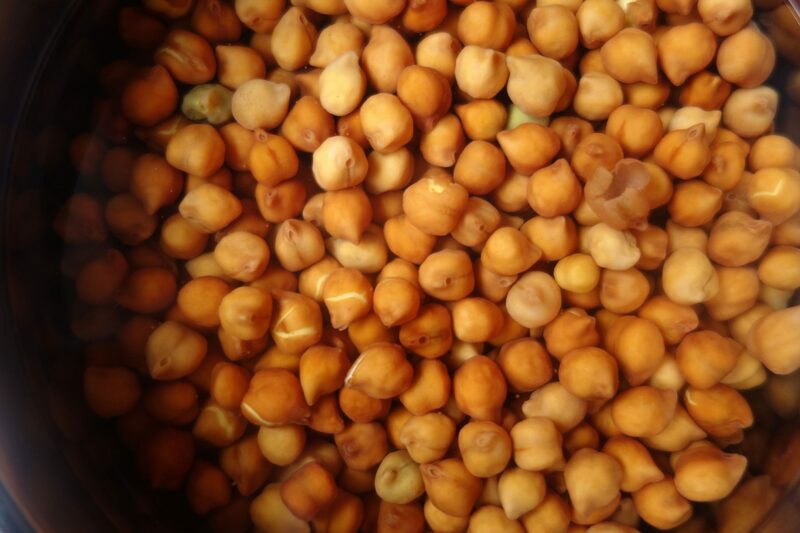 Once the chana have dried, add amchoor, a little garam masala and mix well.